Wednesday, November 15, 2017: 1:00 p.m.
Robots manipulate with super-human speed and dexterity on factory floors. But yet they fail even under moderate amounts of clutter or uncertainty. However, human teleoperators perform remarkable acts of manipulation with the same hardware. My research goal is to bridge the gap between what robotic manipulators can do now and what they are capable of doing. What human operators intuitively possess that robots lack are models of interaction between the manipulator and the world that go beyond pick-and-place. I will describe our work on nonprehensile physics-based manipulation that has produced simple but effective models, integrated with proprioception and perception, that has enabled robots to fearlessly push, pull, and slide objects, and reconfigure clutter that comes in the way of their primary task. But human environments are also filled with humans. Collaborative manipulation is a dance, demanding the sharing of intentions, inferences, and forces between the robot and the human. I will also describe our work on the mathematics of human-robot interaction that has produced a framework for collaboration using Bayesian inference to model the human collaborator, and trajectory optimization to generate fluent collaborative plans. Finally, I will talk about our new initiative on assistive care that focuses on marrying physics, human-robot collaboration, control theory, and rehabilitation engineering to build and deploy caregiving systems. 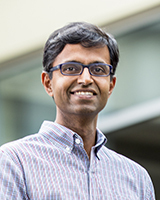 Siddhartha Srinivasa is the Boeing Endowed Professor at the Paul G. Allen School of Computer Science & Engineering at the University of Washington. He works on robotic manipulation, with the goal of enabling robots to perform complex manipulation tasks under uncertainty and clutter, with and around people. To this end, he founded the Personal Robotics Lab in 2005. He has been a PI on the Quality of Life Technologies NSF ERC, DARPA ARM-S and the CMU CHIMP team on the DARPA DRC. Sidd is also passionate about building end-to-end systems (HERB, ADA, HRP3, CHIMP, Andy, among others) that integrate perception, planning, and control in the real world. Understanding the interplay between system components has helped produce state of the art algorithms for object recognition and pose estimation (MOPED), and dense 3D modeling (CHISEL, now used by Google Project Tango). Sidd received a B.Tech in Mechanical Engineering from the Indian Institute of Technology Madras in 1999, an MS in 2001 and a PhD in 2005 from the Robotics Institute at Carnegie Mellon University. He played badminton and tennis for IIT Madras, captained the CMU squash team, and lately runs competitively.